The primary goal of inpatient rehabilitation after a moderate to severe traumatic brain injury is for the patient to improve function – both physically and cognitively. But the course of treatment for one patient may be completely different for another. 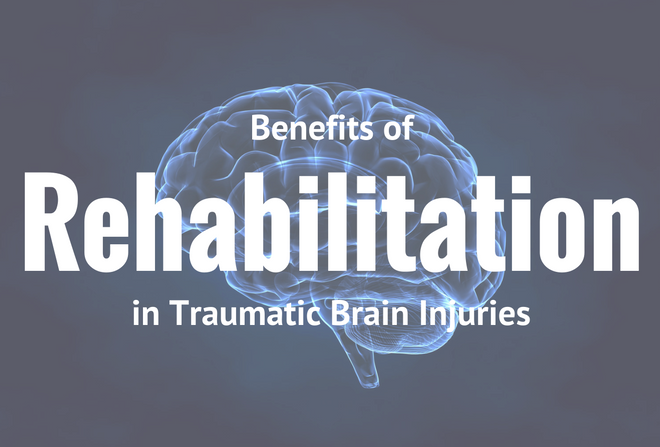 Inpatient rehabilitation is for patients who have a traumatic brain injury that prevents them from returning home after their hospital stay (usually in an intensive care unit). But the goals in the ICU – which include achieving medical stability and preventing a medical crisis – are different from the goals of the inpatient rehabilitation team. There are four common issues that an inpatient rehabilitation team addresses when treating someone who has suffered a brain injury: thinking, physical, sensory and emotional. With thinking problems, patients often have difficulty with memory, language, concentration, judgment, and problem-solving. .Common physical problems include a lack of coordination, a loss of strength, as well as issues with movement and swallowing. Patients may also deal with sensory problems such as changes in vision, smell, hearing, and touch. Patients who’ve suffered brain injuries may deal with emotional problems such as mood changes, irritability, and impulsiveness. The specific therapies in an inpatient rehab facility for those suffering from brain injuries varies from patient to patient. Most patients will receive at least three hours of therapy per day, five to seven days a week. The patient will likely see a physician at least three times per week while the rehabilitation team will consist of a highly-trained team of practitioners including a rehabilitation nurse, physical and occupational therapists, a social worker, a speech-language pathologist, and others. Your family will also be an important part of your rehabilitation team. They will get to know your team’s members, participate in therapy sessions when possible, as well discuss the discharge process. Those who’ve suffered from brain injuries need varying levels of care, and the length of the recovery process depends on the needs of each patient. Inpatient rehabilitation often begins as soon as possible after the patient has been determined to be medically stable. During the initial stages, the rehab team will often work with the patient to regain their activities of daily living: dressing, eating, toileting, walking, speaking, and more. Once the patient is healthy enough to take on more intensive therapy, the next phase involves helping the patient develop the most independent level of functioning possible. Part of this rehabilitation may involve teaching the patient new ways to compensate for physical or cognitive abilities that have been permanently damaged by their injury. The final stages of recovery often involve preparing the patient to return to independent living and/or work. Again, the family plays an important role in this process as they learn ways to make their loved one’s transition as easy as possible. Leaving inpatient rehabilitation can produce plenty of anxiety, but effective preparation will help ease those concerns.